Eating or drinking this tasty, nutrient rich fruit might help to slow of stop breast cancer according to a new study published in Cancer Prevention Research. The work identifies a group of phytochemicals known as ellagitannins, abundant in pomegranates, that inhibit the growth of estrogen responsive breast cancers in the lab. The researchers believe the ellagitannins in pomegranates work by inhibiting a key enzyme (known as aromatase) the body uses to make estrogen, which is suspected of a role in breast cancer growth. "Phytochemicals suppress estrogen production that prevents the proliferation of breast cancer cells and the growth of estrogen-responsive tumors," explains researcher Shiuan Chen, PhD, director of the Division of Tumor Cell Biology and co-leader of the Breast Cancer Research Program at City of Hope in Duarte, California. For this work, the researchers examined the impact of 10 ellagitannin-derived compounds from pomegranates on hormone activity and breast cancer cell growth. The results showed that of the ten compounds, urolithins B most significantly inhibited the growth of the breast cancer cells in the laboratory testing. The results are promising, though more work will be needed to see if eating or drinking pomegranate-derived products will have any effect in people. Pomegranates have gotten a lot of attention recently - becoming one of the most talked about "superfoods" out there because of both the heart healthy and anti-cancer benefits. This latest work is the first to look at breast cancer growth, and we'll likely hear of other studies as the year 2009 saw no fewer than 20 clinical trials registered with the National Institutes of Health to look at pomegranate consumption on many diseases. If you're concerned about your cancer risk, or just want to take advantage of the potential health benefits, consider making pomegranates a regular part of your diet - Even at the risk of pink hands, a juice splattered shirt and the effort needed to enjoy the fruit. If you've never tried one, pomegranates have a unique, very pleasant flavor. You can eat the seeds themselves, or add them to salads, meats, or other grain pilaf dishes, even deserts. If you have the option between the fruit and its juice form, always try to choose the fruit, as it has natural fiber as well as antioxidants, vitamins and minerals. You can buy the fruit in juice form, though it can be expensive and comes with more than its share of calories. Often it's easy to drink a lot more calories than you realize, so watch your portion sizes and keep your intake to 1.5 ounces of the juice. If the taste is too strong for you, try mixing it with mineral or seltzer water, or with blueberry or cranberry juice for a super rich antioxidant drink. It's also a great addition to your favorite smoothie recipe, or mix it with plain yogurt or cottage cheese. There are even pudding recipes out there that are delicious and healthy too. There are stores where you can buy pomegranate paste that's made with molasses. This lends itself to glazes, dips and salad dressing recipes. 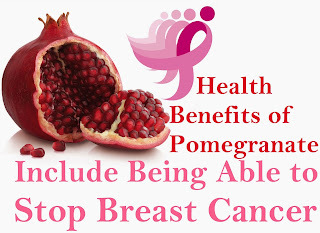 No matter what form you choose, enjoying delicious, good for you pomegranates might be one of the best, most natural ways to give your body healthy nutrients and perhaps women might also be able to stop breast cancer from developing.